I remember after the Paris alleged terrorist attacks the claim was that Europe needs an integrated EU wide intelligence service, in order to share information and co-ordinate against alleged international terrorist organizations. And it follows their argument that they must be claiming those alleged terrorist groups were orchestrating these attacks. Which I believe in the wake of the Paris and Belgium alleged attacks, the EU nations did sign an agreement to merge their intelligence/interior Ministry type of police into one EU led organization. Although I have not read about that agreement since. To give the authorities some credit, to have an area where people can freely travel between countries, but intelligence services who don't even speak the same language, and definitely are not co-ordinated, is a glaring weakness. Organizations like the FBI in America were created to fight inter-state criminal organizations, as most policing in America is directed by the state governments and even more so the local governments. But in America, before police even have a chance to interview the suspect, the narrative is 'lone wolf'. So I was curious if the Swedish press is arguing that this immigrant was commanded to carry out this attack, by an international terrorist organization. I question the validity of any narrative put forth by any agency of the state in regard to ensuring safety since the foundation of the state itself is predicated on the violation of safety. Some of you may remember that back in February 19 this year, commander-in-chief Donald Duck Trump expressed his (*cough*) concern and outrage over a purported "terror attack in Sweden". At the time, of course, nothing had happened in Sweden - and people were wondering what the heck he was talking about. What?? It can actually speak? At around 30 second Trump says there was 'no documentation ... of those people'. I assume Trump is referring to Arabs/Muslims or more specifically Syrians. Clever to be so vague so that we, as listeners can fill in the blanks of who 'those people' might be. Concerning Syrians, they are indeed well documented. The United Nations and their highly organized human processing stations called the United Nations Refugee Camps has captured nearly every single Syrian who needs documentation that has fled their country in fear. United Nations refugee camps were set up in advance of incoming refugees. Previously I had made a post about the suspicious timelines but can't find it now. The United Nations had extremely uncanny insight to set up half a dozen camps for tens of thousands of people even before the mass exodus had begun in 2010. The U.N. has documented and processed over 5 million Syrian refugees. Here is a U.N. report about all the humanity and happiness that Syrians have received in their resettlement process thanks to the U.N. I know personally a dozen Syrians with passports and wealth who left Syria in anticipation of any violence or war. These well documented Syrians have resettled in America. The hordes of 'those people' could not get into a western nation unless they were first well documented. The United Nations has a strict policy about releasing refugees. One is basically a prisoner in a refugee camp. The only way to get out is to either be personally sponsored by a family in another country or be sponsored by a government. To be sponsored means that the sponsor takes financial responsibility for the refugee. Here is a wiki showing documented Syrian refugees by country. It is an outright lie that gangs of undocumented Syrians were allowed into any country. I know this is pretty much an open and shut case for the fine researchers here at Cluesforum, but for due diligence and also because this hit home here's my list of telling circumstances. Please add to it. The Trump speach was interesting Simon. Did he mix up his memos maybe? 5-10 min after the event media reported this as a terrorist attack. How could they know so soon that this was not an accident or a lone crackpot? No guns or bombs went off. There was also reports on the radio about police that shouted "Run terrorists!" The street that the truck rode on was closed because of construction work. 30-40 min after the event, the Swedish Parliament had a crisis meeting and after it, the prime minister Lofven declares Sweden has been attacked. No evidence of terror or that anyone had been killed was known at this time. Numerous false reports about shootings around Stockholm. To cause confusion and keep people away from the streets? And of course the terrorist drill one day before the event. Rakhmat Akilov. One of the alleged terrorists. I'm not skilled at seeing image manipulation, but to me this image looks very fake. Reminds me of the image of Breivik in a car. patrix » April 11th, 2017, 6:44 am wrote: Rakhmat Akilov. One of the alleged terrorists. I'm not skilled at seeing image manipulation, but to me this image looks very fake. Reminds me of the image of Breivik in a car. Must be the scandinavian way of concocting 'PHOTOGRAPHIC PROOF' of the "flesh-&-blood-reality" of those fearsome* tewwowists... Good grief. (* "fearsome" as in "feared by some"). Seriously, it is very sad to me that most fellow Swedes and Norwegians truly fall for this crap - hook, line and sinker. Yes, I can only imagine the frustration you Simon, Hoi.Polloi and all the other skilled researchers here must be feeling and have been feeling for more than and decade(!) And Swedes and Scandinavians in general are very gullible. But I have at least some colleges and friends that are waking up. Mostly because I have this excellent site to direct them to. It is always darkest before dawn. The day before she practiced on a fictitious scenario in which a bomb was placed at Åhléns. - When I heard what had happened, I could hardly believe it was true. It was just as we had practiced, she says. Nurse Agneta Carlswärd Kjellin, 56, supported many anxious when she staffed emergency phone after Friday's suspected terrorist attack in Stockholm. Last Thursday organized SLL a course for a group of supporters of crisis. There are doctors, psychologists, counselors, deacons, priests and nurses to support and answer questions during a major accident, natural disaster or an attack that affects the citizens. The day after the training occurred the suspected terrorist attack in the heart of the city when a truck drove on several people, killing four before it crashed in Åhléns City. - I was just waiting to be called in Friday. On the one hand, you want to be and do what you have just trained and contribute. But while such anguish before the first talks, says Agneta Carlswärd Kjellin, nurse and emergency supporter at St. George's Hospital. As she followed the reporting of the incident she was struck by the similarities with education. - On Thursday, we simulated an explosion at Åhléns. It was a fictitious scenario with media reporting that someone planted a bomb in the Åhléns city - and then detonated it at Åhléns in Skärholmen, she says. She called first on Sunday to answer questions troubled residents and to man the phone more week. - We got all kinds of calls from people who were there on Drottninggatan, people who worked nearby and from those who were concerned that it will happen again. There were very many who called in. "Every time we kept training, something has happened"
- The exercise we have had in many, many years, we train crisis supporters to give a good crisis support over the phone. There is a training we've had in 17 years. It is about meeting people acutely. The course is very highly appreciated, says Charlotte Therup Svedenlöf, licensed psychologist and head of the unit for crisis and disaster psychology. - I was so thankful that we have such a great crisis of supporters in Stockholm County Council. Two American papers, 'The Hollywood Reporter' and "Variety' no less, are now saying that Chris Bovington was an executive with music streaming service Spotify. Although his 'family friend' James Hunt, obviously a poor actor, needs to read from a script in a BBC interview to describe how Chris was a "lovely mate". Use the link below and scroll down the web page to the video. ...and copy of Angling Times. What a piece of crap! Who took this "photo" Hans Liarsson? The worst fakery I have seen. Sweden joins the list of Cunts who use Fake Terror for political ends. More on vicsim Maïlys Dereymaeker. This was interesting – It seems that the first medic to arrive on the scene was the same medic that was first at the alleged murder of Swedish Prime Minister Olof Palme 30 years ago. I do not think the Palme murder went down as advertised. It was more likely a media hoax similar to the Kennedy murders. 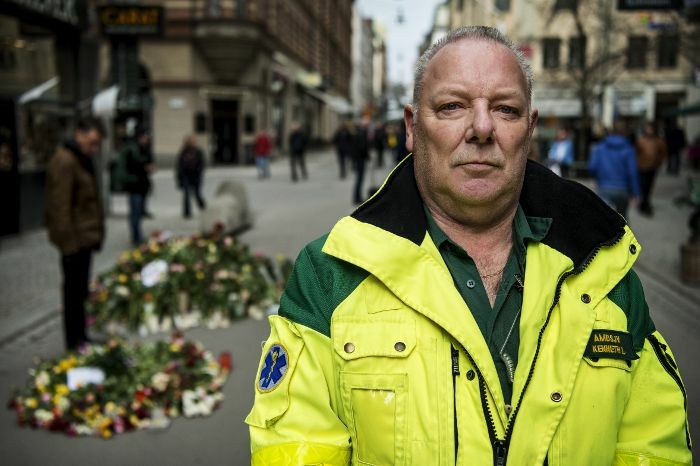 Kenneth Lavrell was also the first paramedics on site after shootings at Stureplan in Stockholm , In December 1994, in which four people were shot dead. To me that puts that event into serious question as well. I have never looked into it. patrix » April 12th, 2017, 4:19 pm wrote: This was interesting – It seems that the first medic to arrive on the scene was the same medic that was first at the alleged murder of Swedish Prime Minister Olof Palme 30 years ago. I do not think the Palme murder went down as advertised. It was more likely a media hoax similar to the Kennedy murders. Yep! No need for any fancy schmancy ELA when you've got eyes. I think if you use the Search box you might find some Olof Palme and I think we're all pretty much in agreement here on the nature of said "assassination". And yes the clowns like to play join the dots with their fairytales. What, no mention of Ted Gardestad? It wasn't his shop or something was it?